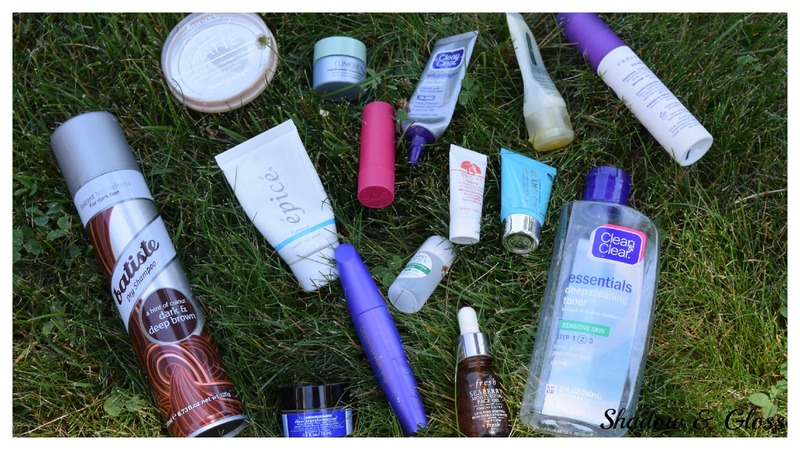 So today’s post is another empties post. I love writing these, and hopefully you like reading them!! Clean&Clear essentials deep cleaning toner for sensitive- really good for oily skin! I only use this every other day during the summer when my skin is more oily. Rimmel Stay Matte powder- so good! definitely the best drugstore powder I have tired! It keeps you super matte, but never looks cakey. Covergirl lashblastfusion mascara- I really liked this mascara. It gave great length and volume. I recommend this if you’re in the market for a new drugstore mascara. Fresh Seaberry oil-I bought this because of Jaclyn Hill’s recommendation from like a year and a half ago. Unfortunately, I hated it! I didn’t think it did anything for my skin at least. So i used it as a cuticle oil instead of a face oil. Epice purifying exfoliant- I got a deluxe sample size in an ipsy bag, and i really really loved this exfoliator! I think I will purchase a full size once i finish other exfoliators i have. Origins GinZing refreshing face mask- Although i only had a sample of this product, I think i used it enough to share a mini review. I would use this in the morning right after washing my face. It was amazing at brightening and making my skin feel awake. My only problem with this is that i wouldn’t remember to use it in the morning so I don’t think i would purchase a full size, but if this is something you would remember to use, I would definitely recommend it! Glamglow hydrating mask- 3 words. BEST THING EVER! So worth the price! EOS stick lip balm- I actually really liked this! Its much better than the circular shaped EOS lip balms. Ole Henriksen sheer transformation- I think I’m going to do a full review on this product, so I won’t go into detail here. All i’ll say is that i have a love hate relationship with this moisturizer. Clinique dramatically different moisturizing lotion+- I absolutely love this for a morning moisturizer! This is good for both combo and dry skin types. Clean&Clear advantage acne spot treatment- I used to notice a huge difference when I first started using this, but after a while i didn’t see it doing anything. As of now, I don’t think i’m going to repurchase it. Mario Badescu cucumber cleansing lotion- I only had a sample of this, but I honestly needed to include it because it’s so good! I’m not normally a fan of toners but I really really liked this one, and will definitely be picking up a full size! Okay! WOW thats a lot of empties, anyways I hope you guys enjoyed this post! I always feel so accomplished when I finish a whole product! Leave a comment below with ideas for posts you would like to see!